This event just went from a show to a mini festival! We have added some more spectacular and rootical entertainment to the line-up. 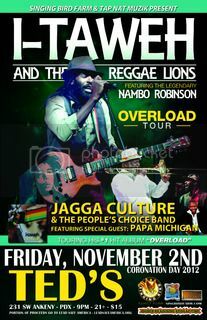 Jagga Culture supported by The People's Choice Band with Special Guest Papa Michigan! Donavan "I-taweh" Cunningham was born in the hills of St. Ann, Jamaica to Rupert and Ruby Cunningham. Like most successful Artists, he comes from humble beginnings. I-taweh was raised in the farming community of Prickly Pole, in the hills of St. Ann, Jamaica. Just a few miles from the home where Bob Marley grew in Nine Mile. He spent most of his childhood farming alongside his father and four siblings. Growing up he played music with his family and friends, but his musical career started shortly after his move from the country to Kingston in 1992, where he was given the name “Danny Gitz” because of his growing reputation as an outstanding guitarist. He began his first tour with “High Symbol” in 1994. He then went on to become the youngest member of the original Nyabhingi group “Mystic Revelation of Rastafari” and extensively toured Europe with them. During those years he was also doing significant work as a band leader for the original "Dance Hall King" Sugar Minott and later became the guitarist for Everton Blender. His work with Everton Blender brought him to the U.S. in 2004 where he then became the bassist for the “Yellow Wall Dub Squad” a major backing band for headlining artists in the U.S. and the opening act for the artists they were playing for. My name is Ronald “Nambo” Robinson, and I am a veteran musician, vocalist, percussionist and recording artist in Jamaica. I am recognized among my peers as one of Jamaica’s foremost trombonists. I have recorded with various artists such as Bob Marley, Dennis Brown, Jimmy Cliff, Lauryn Hill, Gregory Isaacs, Peter Tosh, Bunny Wailer, Beres Hammond, Shaggy, and Buju Banton. Also I performed live with Aretha Franklin, Gladys Knight, The Four Tops, Lloyd Parks and We the People, The Tony D’Acosta Affair, The Boris Gardener Happening, Light of Saba and Mystic Revelation of Rastafari. This vast array of experience not only made me a true expert in composing reggae music, but also exposed me to genres such as jazz, classical and rhythm and blues. I have recently launched a series of shows that feature young Jamaica musicians. The purpose of this effort is to showcase these talented young musicians while celebrating the various genres of indigenous music such as Mento, Ska and Rocksteady. I have launched solo projects with the release of four album/CDs, titled Reggae in my Bone, Nambone Ska, Nambo Sing and Play and Raw Roots Rock Reggae. Along with that, I perform regularly at studio sessions for many of the island’s contemporary artists. where is the show? sorry if it says and i just missed it. sounds like good time! ras, you gonna be at KBOO today for the interview? Bun N Cheese are you going to be in the DJ booth for that? I am thinking about coming to this show but money can be tight sometimes. The 75$ in gas that gets me. I sleep in the back of my 4runner to make it lighter on the pocket book. Anyway would love to come for this show so I will see if I can pull it off. shocks of sheba we will be hosting i-taweh and nambo in the KBOO studio for a little interview session during our show this thursday from 12p-2p . we will have pairs of tickets to give away to this concert; listen and call in to win tix, and attend the concert courtesy of KBOO radio! that would lighten the load on the pocketbook! Looks like Higher Reasoning Sound aka Ras Danny will be there. Edited 1 time(s). Last edit at 10/29/2012 06:28PM by bun n cheese. Sounds good Mosquito Killer! I will try to tune in work permitting! I - Taweh was amazing at NWWRF this year. Is Teds a pretty cool venue? it's a venue, so that's cool. HAHA! "its a venue, so thats cool" I will check out Ted's online. Must be a smaller venue cause ive never heard of it till recently. Ted's used to be Berbati's Pan, which was used by reggae acts regularly. They changed up the building space a little to alot more space to Voodoo Donuts, but its basically the same. Ok yeah I have heard of Berbati's pan before. Voodoo Donuts getting more space huh. Man people love those donuts. Less Donuts and more reggae i say! The venues i have been too is the Wonder ballroom for Groundatioin and Midnite shows. Mount Tabor, Crystal Ballroom and the Roseland. Teds is downtown, just a few blocks from the Roseland. Nice! Does the Roseland not put on much reggae anymore? Or just bigger name acts such as the Marley's. Heard it was a great show!